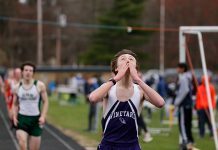 Martha’s Vineyard Regional High School teams dominated their island rivals from Nantucket on a busy Saturday in Oak Bluffs. 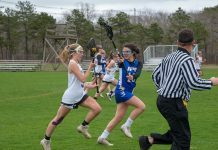 The Vineyarders and Whalers played three varsity and two jayvee contests, with Martha’s Vineyard winning four and tying one. The varsity field hockey team kicked off the afternoon with a 2-0 win, improving to 5-3-1 on the season. The Whalers controlled possession for the first 20 minutes but had nothing to show for it. Against the run of play, M.V. scored with 9:39 left in the first half. Belle Dinning slapped the ball through a maze of players into the cage from 15 yards out. The Vineyarders seized the momentum and never let go. Lee Hayman added the insurance goal with 10:29 left in the game. Over on Dan McCarthy Field, the girls varsity soccer team also sank the Whalers, 2-0. Two players called up from the jayvee squad scored the goals. Madison McBride put the hosts in front in the 34th minute. Olivia Smith put the initial shot on goal and McBride alertly followed the play, slotting in the rebound from 10 feet out. Natalija Lakis made it 2-0 in the 61st minute by scoring on a mad scramble in the crease, following a Lucy Hackney free kick. A few minutes after the girls match concluded, the boys jayvee soccer team prevailed 2-1. 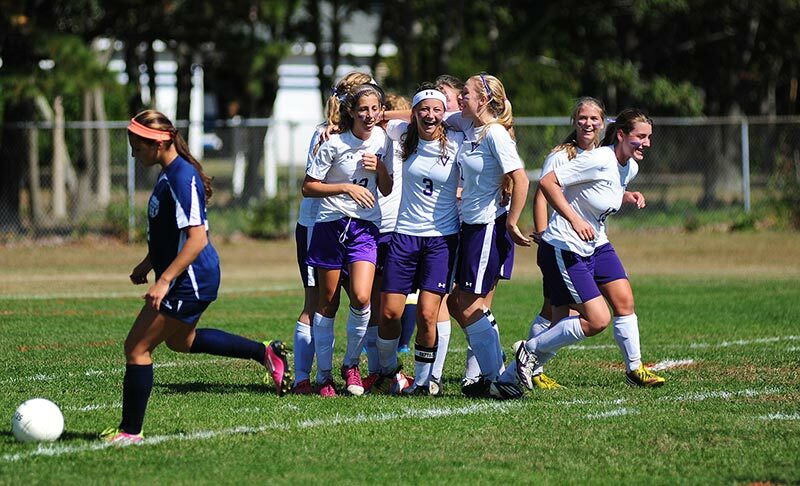 Nainoa Cooperrider and Nick Bonneau scored for the Vineyard. The Whalers salvaged their only point of the day with a 1-1 tie in the jayvee field hockey game. Gabi Hoxsie scored early in the first half for M.V. but the Whalers equalized midway through the second. The afternoon concluded with the boys varsity soccer match. The passion in the stands matched that on the field. The fans screamed and yelled with every bounce of the ball as the players competed at a frenzied pace. The Vineyarders put the match away in the first half. Lee Faraca opened the scoring in the 10th minute by heading in a rebound from 15 yards out after the Nantucket keeper punched the initial shot high into the air. Jason Lages scored the final two goals in the 3-0 win. The first came on a perfectly executed free kick low to the right post in the 31st minute. On the second, Lages rushed 50 yards down the left flank, deked the goalie, and coolly shot the ball into the right corner. David DaSilva played well in net and earned the clean sheet. 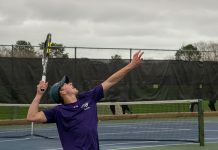 Coach Damon Burke’s team remains unbeaten with seven wins and two draws heading into a big Eastern Athletic Conference match Tuesday in Oak Bluffs against Bishop Feehan. Kick off is at 3 pm.